This brochure is item #3560 and is called the “Welcome” brochure. At www. eldstonecabinetry.com, sign up for our newsletter highlighting trends, new products, and before-and-after transformations. Fieldstone Cabinetry is CARB II compliant and ESP certified. All products impact the environment. For ESP program criteria, visit www.kcma.org. 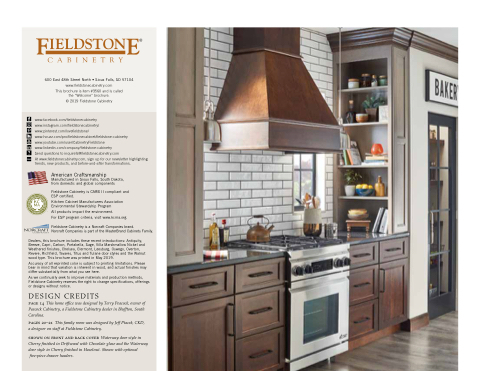 Fieldstone Cabinetry is a Norcraft Companies brand. Norcraft Companies is part of the MasterBrand Cabinets Family. Dealers, this brochure includes these recent introductions: Blueberry, Cranberry, Frost and Homestead Fog  nishes, Vance, Vesper, Xandra and Xena door styles and the Walnut wood type. This brochure was printed in January 2018. Accuracy of all reprinted color is subject to printing limitations. Please bear in mind that variation is inherent in wood, and actual finishes may differ substantially from what you see here. As we continually seek to improve materials and production methods, Fieldstone Cabinetry reserves the right to change specifications, offerings or designs without notice. page 14 This home office was designed by Terry Peacock, owner of Peacock Cabinetry, a Fieldstone Cabinetry dealer in Bluffton, South Carolina. pages 20–21 This family room was designed by Jeff Ptacek, CKD, a designer on staff at Fieldstone Cabinetry.